Women In Travel Summit (WITS) is an empowering sisterhood networking event for women in all genres of the travel content creation industry – writers, bloggers, influencers, and brands that help support diversity in travel. Each year, WITS partners with host destinations throughout North America drawing together some of travel’s most energetic, knowledgeable, and supportive network of women. This year WITS went international for the first time to the distinctly French (and friendly) Quebec City. Once I learned the destination for the conference, I immediately began scouting places to stay. Depending on the length of my stay, I always start my search with b&bs, boutique hotels, then major chains – in that order. I love the personality and homey feeling I usually get when I stay at a b&b or a boutique hotel. Often I have sat with the owner over a cup of coffee after breakfast as we discuss the agenda for the day. They usually have local insider tips on where to eat lunch or dinner, where to go that is not in a guidebook, and exciting stories that lead me to a memorable experience. The boardwalk of Terrasse Dufferin is perfect to people watch. This trip I stayed at the Hotel Terrasse Dufferin, a multi-generational family run boutique hotel. Located on the wooden boardwalk off Terrasse Dufferin overlooking the St. Lawrence River Hotel Terrasse Dufferin was a unique find and a gem to stay in. A sitting room in Hotel Terrasse Dufferin. It has been a long since I have seen a payphone. I love these European windows. This is a closeup of the sitting room window. I truly enjoyed the “European” feel of this boutique hotel in Old Quebec City. As you walk through the lead-window front door into the foyer, a curved staircase greets you leading up to the second and third floors. The sturdy post and railing reminiscent of a clipper ship railing that offers insight to the builder of the hotel – Henry Fry, a merchant shipbroker for Lloyds of London. I loved the vintage decor of the room in this boutique hotel. There was a small television, not a flat screen. There was a coffee maker and an electric teapot – no digital lights, no Alexa talking to you, just a strong brew of jo. Then there was the telephone. I will admit to you; this was my single most favorite item in the room because it brought a sense of nostalgia from when I was growing up. It was an ivory-colored desktop rotary phone. I had not seen one in use for nearly thirty years. Truth be told, I still have ours. It is packed away in one of those boxes full of memories; you know the one with school trophies, your grown kids baby clothes, your favorite record (never mind there is nothing to play it on). There was complimentary wifi, so I could be connected if I chose to be. The rooms are comfortable and relaxed without digital noise. Ideally situated, Hotel Terrasse Dufferin is within walking distance to many areas of Old Quebec. See stunning displays of Gothic Revival architecture, Petit Champlain – a cobblestone street straight from the Charles Dickens play “A Christmas Carol” lined with restaurants and shops, Upper Town, Lower Town, and many historical sites. 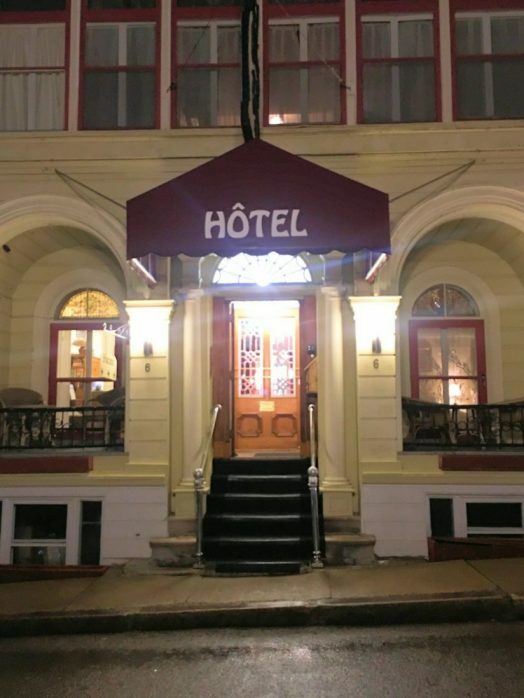 If you are looking for a friendly comfortable boutique hotel during your next visit to Old Quebec City that will leave some coins in your pocket so you can spend more on seeing sights, I recommend Hotel Terrasse Dufferin. This is one entry that I thoroughly enjoyed reading. I found it very interesting and knowledgeable and if I ever get a chance to make a trip to Quebec this is one place that I would put on my list to visit. Thank you Donna for sharing that with us!